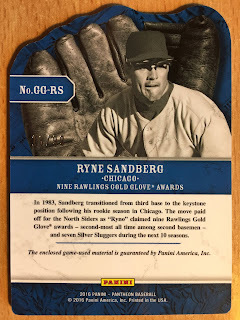 Another week, another page to display from the HOF Binder. 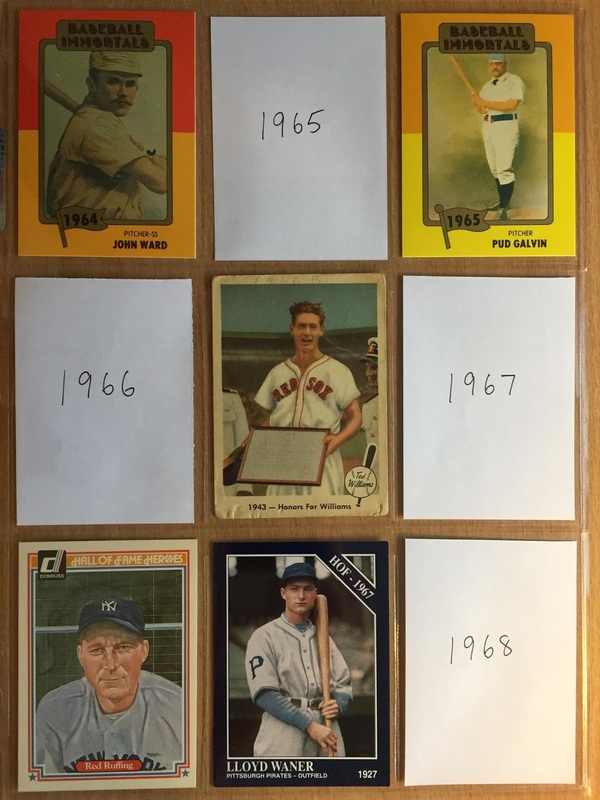 Page 14 gives us a few more obscure names, three more Conlon cards (which is two too many) and a sweet Topps card from 1960. No more delaying, let's get to it! I recognize Kiki Cuyler as a Cub, but he also played seven years with the Pirates, three years with Brooklyn and a year with Cincinnati. He was a fine outfielder who had a career 0.321 batting average and was a threat on the base paths. Four times he topped the circuit in stolen bases, but never swiped more than 43 in a season. His age 26 season, 1925, he finished second in the MVP race when his Pirates won the World Series. 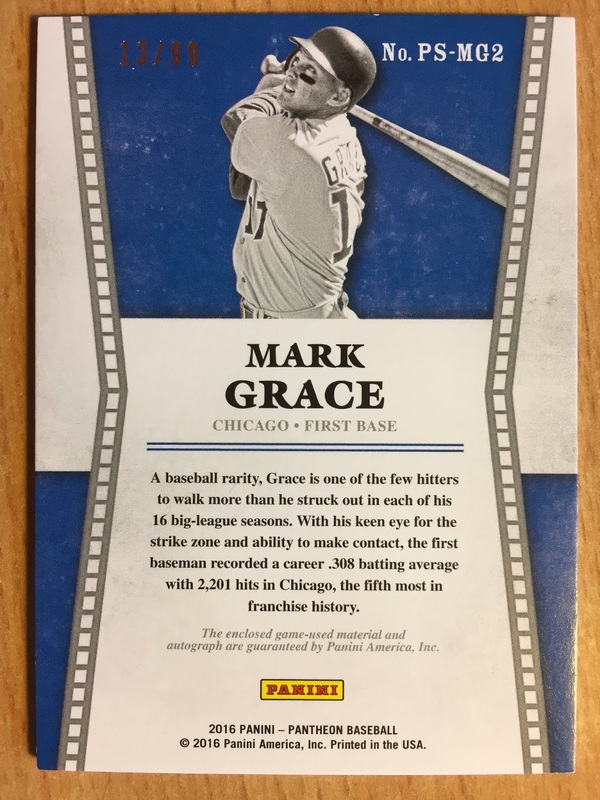 That year he scored 144 runs, hit 43 doubles, 26 triples, 18 homers, knocked in 102 and also stole 41 bases while batting 0.357. What a year! 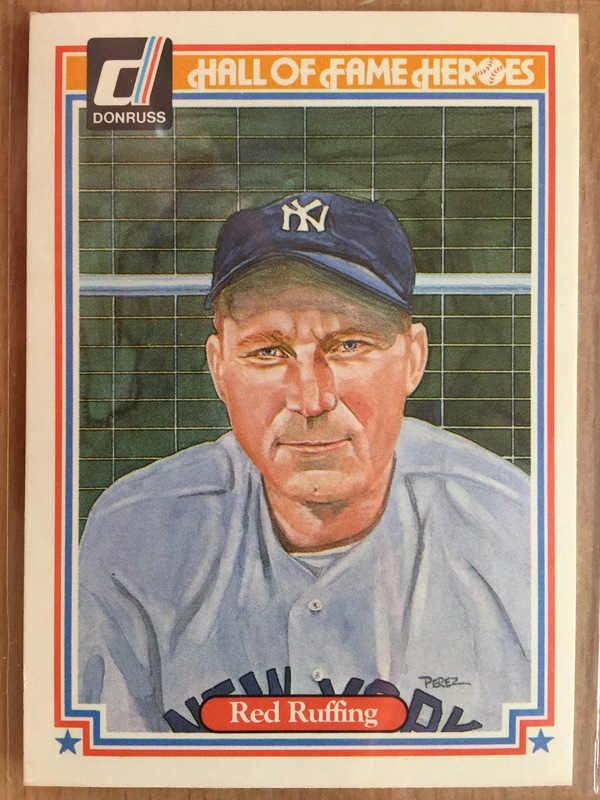 Goose Goslin played during the same time frame as Culyer, and he mostly suited up for the Washington Senators. Also an outfielder, he was more of a power threat in the middle of the order. 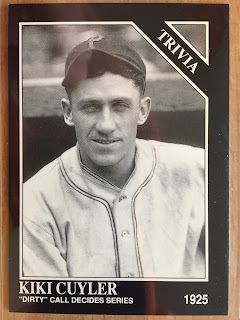 Gooslin won a batting title with a 0.379 average in 1928 and was also a member of two World Series teams. The career 0.316 hitter had a 14 year stretch in the middle of his career he averaged just under 100 runs scored and over 100 RBIs per season. 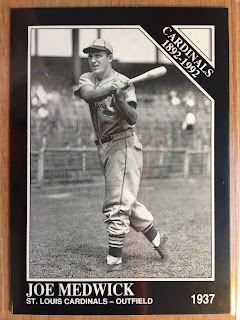 Joe "Ducky" Medwick played 17 years, 11 of which were with the Cardinals, and is our third outfielder in as many players in today's post. 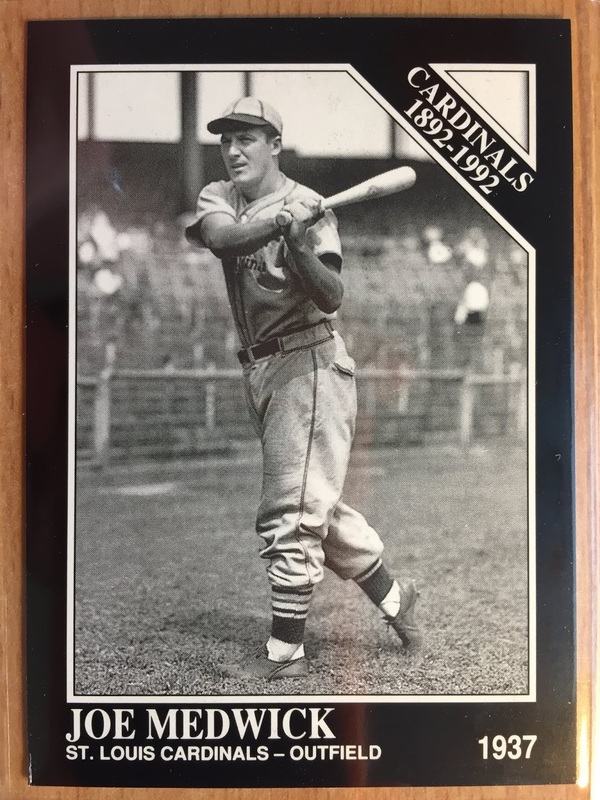 He was a career 0.324 hitter, a ten time All-Star, and he won the triple crown during the 1937 season with 31 homers, 154 RBI and a 0.372 average. 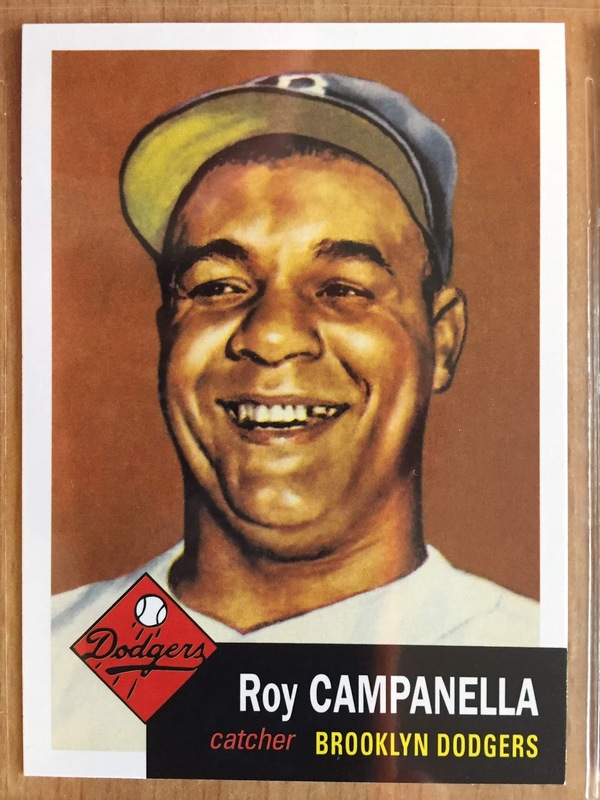 Roy Campanella only played ten years in MLB, but that's because he got a late start due to the color barrier in baseball. He was 26 years old in 1948 when he finally got his chance with the Dodgers. In 1937 Campy actually started his professional career at the age of 15. He was paid more to catch games on the weekend than his father made all week. I'm sure that went over well at home! He was an eight time All-Star and won three MVP awards. Overall, he was one of the game's more productive and popular catchers. 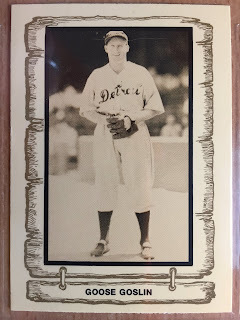 Stan Coveleski pitched for 14 years to the tune of a 215-142 record and 2.89 ERA. He played the majority of his career with the Indians, but here is pictured in a Yankees uniform, with who he played only twelve games. 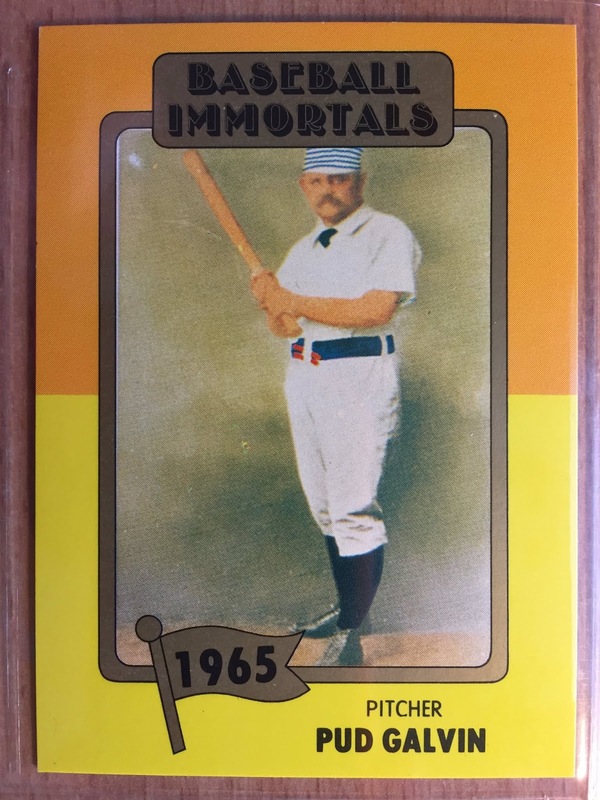 He won two ERA titles during his career and three of four games in the 1920 World Series. 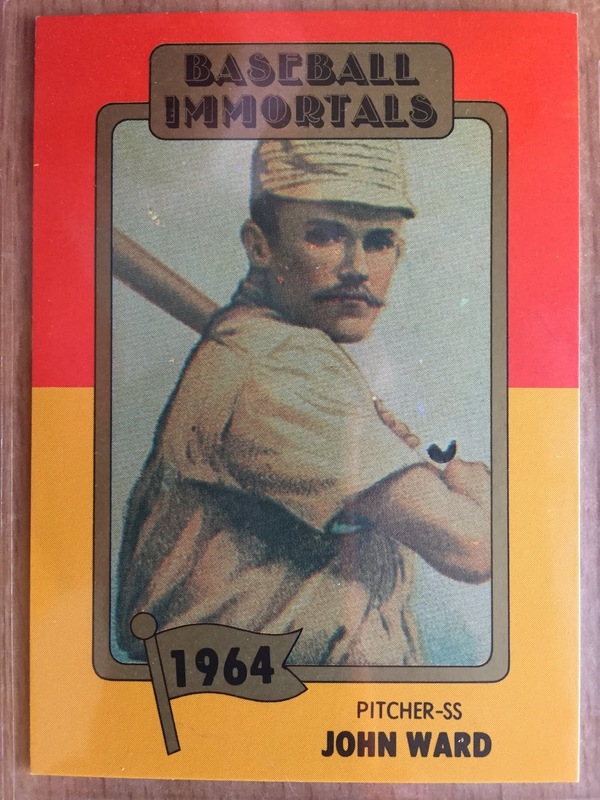 Pitching during the Dead Ball Era he averaged 300 innings for a number of seasons while posting a 2.3 BB/9 rate and 2.9 K/9 rate during his career. Baseball sure was different back then. Waite Hoyt, nicknamed School Boy, made his MLB debut at age 18 in 1918. He would pitch twenty-one seasons in all, with seven different teams. 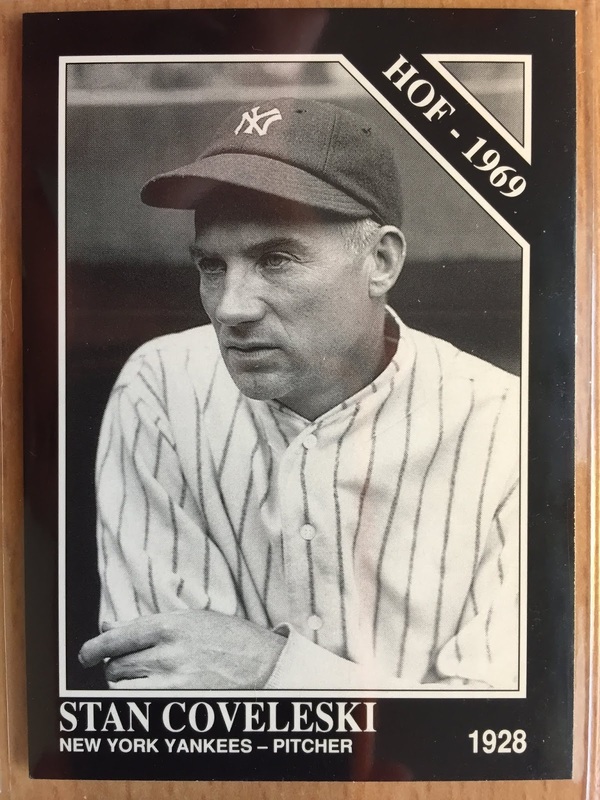 In 1927 he led the league in wins with the Yankees, but that's the only time he led a popular pitching category. He finished his career with a 3.59 ERA and a win-loss record of 237-182. 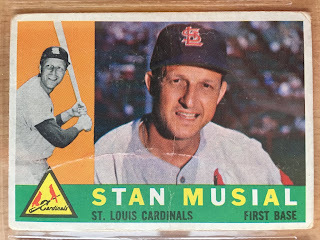 Stan "The Man" Musial. He missed his age 24 season due to military service, but otherwise he was one of the best players in baseball during his 22 year career. He won three World Series, seven batting titles, three MVP awards and was elected to the All-Star game in twenty of his seasons. Amazing. 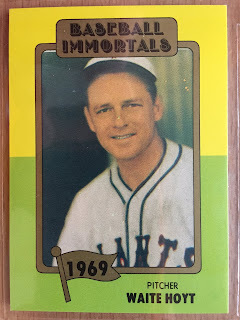 Musial is a very popular player in my area, and being able to find a vintage card of a player of his caliber within my budget took some patience. 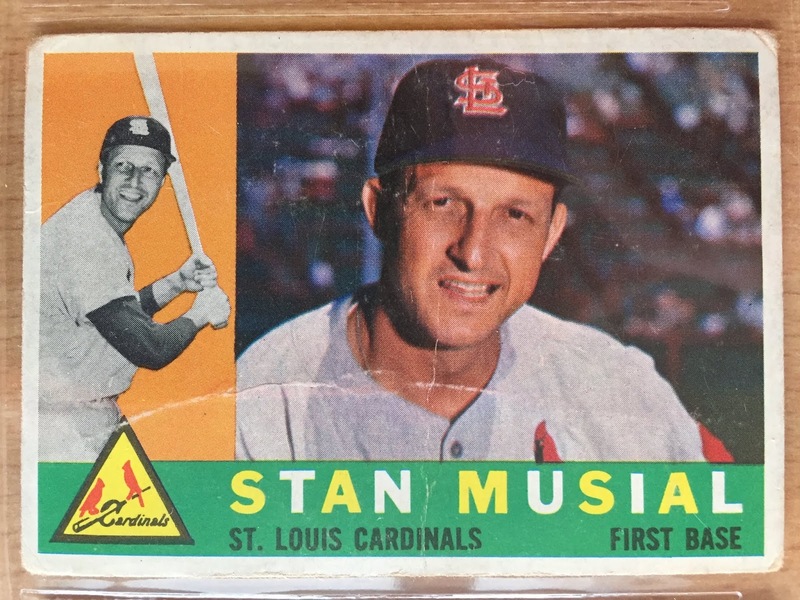 This 1960 Topps card of Musial is one of my favorite non-Cubs cards in my collection. Fuzzy corners and creases just add character to my favorite card on the page. Musial wins that honor hands down. 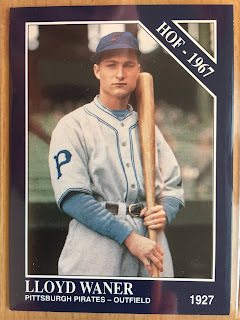 The card I would like to replace most is the 1983 Cramer Baseball Legends card of Goose Goslin. It's a very plain looking card with no color to it whatsoever. Ugh. 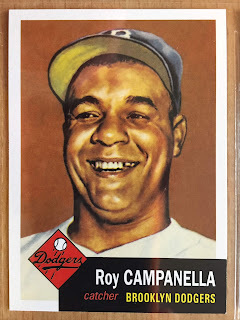 Some day I would like to own a vintage card of Campy, but that will have to wait until I find a beauty of a deal. Up to this point I've written about 98 of the members of the Hall of Fame. Next week I'll pass the century mark. Stay tuned! Most know me as a Cubs guy who has an odd infatuation with a player no one has ever heard about. I hear that Mike Trout guy is pretty good. Tim Anderson has been red hot. 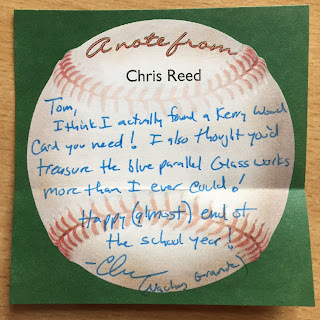 And lookie there... there's that AAAA-player P-town Tom is always posting about. How 'bout that! The Mariners are setting records for most consecutive games hitting a home run to start a season. Vogelbach isn't doing it all by himself, but with 6 homers he does have more than the entire Detroit Tigers team as of this post. After Vogelbach hit a 10th inning frozen rope to the bleachers in right-center today he got a little extra love on social media. Vogelbach has a fun and energetic personality. I love this picture above! I'm not a big rap guy, but I dig this tweet. Vogelunit? I'm not sure I can get behind that nickname. VogelMONSTER! Zippy Zappy alerted me of this next and I'm glad he did. Hehe. The baseball world is taking notice. I'm really enjoying the ride and to this point in the season I've actually watched more highlights of the Mariners than the Cubs. I don't know how long Vogelbach will keep mashing, but I hope he does enough damage, long enough, that he doesn't fall back into a part-time role when Kyle Seager gets off the IL. Watching your favorite player sit behind Edwin Encarnacion, Jay Bruce and Ryon Healy isn't very entertaining. You know what is entertaining? Vogelbombs to win games in extra innings! Maybe he makes enough of a splash that he makes the Home Run Derby? That would be insane, and it's probably crazy talk on my part. I'd love it though, even if it meant I'd never be able to afford one of his autos or early rookie cards again. Thanks for checking in and all of your Vogelbach support! Welcome to Page 13. 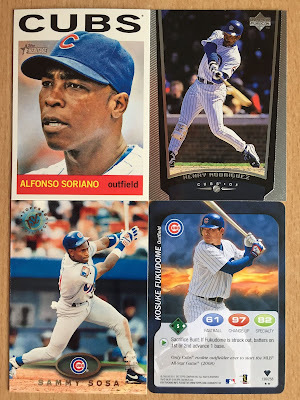 We start off this week with a couple of TCMA cards of players from the 1800s, and we finish strong with one of the best baseball players of all-time, a beautiful card from 1983 Donruss and a nice colorized Colon. John Montgomery Ward was the youngest player in the National League in 1878 at 18. Three years prior he played on Penn State University's first baseball team and was given credit for inventing the curveball. 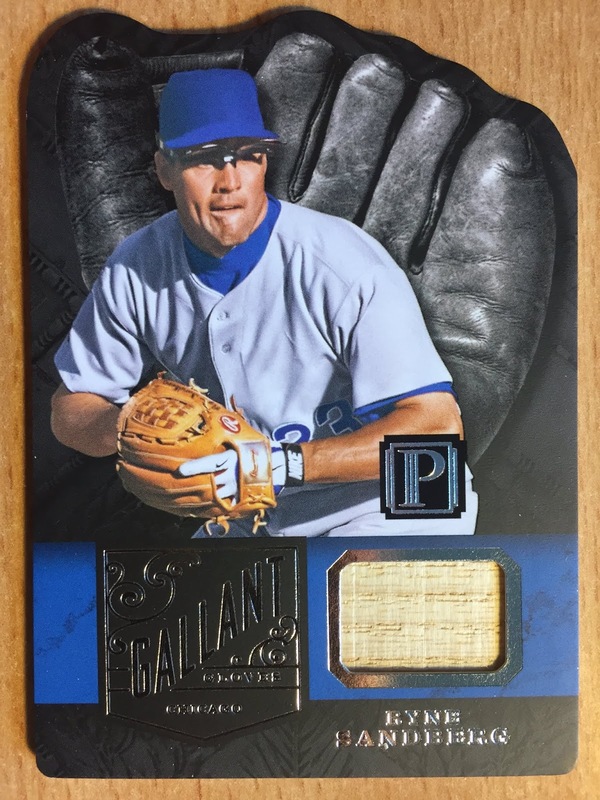 With the Providence Grays he started out as a pitcher, which was a role he excelled at for seven seasons with a 164-103 record and 2.10 ERA. Later he switched over to a middle infielder and in 1887 he hit 0.338 and stole a league leading 111 bases. He was also a player/manager for seven years and had a career winning percentage of 0.563. If you want to read a fun player biography and have ten minutes to kill then I suggest you grab your favorite beverage of choice and click here. Pud Galvin pitched his entire career in the 19th century for teams like the Buffalo Bisons, the Pittsburgh Alleghenys, the Pittsburgh Burghers and the St. Louis Browns. He was a horse on the mound and averaged well over 500 innings pitched each of his first six full seasons. Galvin finished his career with a record of 365-310 and an ERA of 2.85 during the Dead Ball Era. Ted Williams had just won his first of two Triple Crowns at age 23 when he was drafted into the military. The Splendid Splinter finished his career with 2,654 hits, but surely would have have amassed more than enough to join the 3,000 hit club had his career not been interrupted. He was a nineteen time All-Star and his baseballreference.com page has so many numbers in bold font that you almost have to wonder if he didn't lead the AL in everything during the prime of his career. 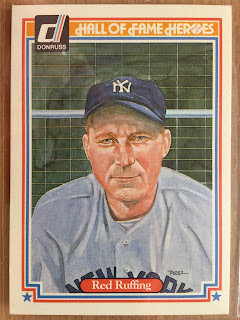 Red Ruffing suffered through a tough period in Red Sox history where the owners were selling off its stars to help ends meet. Eventually, Ruffing was sold to the Yankees and that's when his career took off. 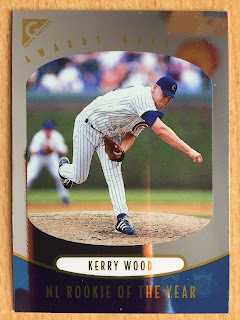 He had a 4.61 ERA and .289 winning percentage with Boston, but those numbers drastically improved with the Yankees: 3.47 and .651, respectively. He finished his career with 273 wins and surely would have made the magical 300 mark had he not been drafted into WWII and missed three seasons or had he started his career with some other team than Boston, which averaged 101 losses during his first five full seasons. Overall, he was a six time All-Star, a six time World Series Champion and at one point he was the second highest paid Yankee on team stacked with stars. 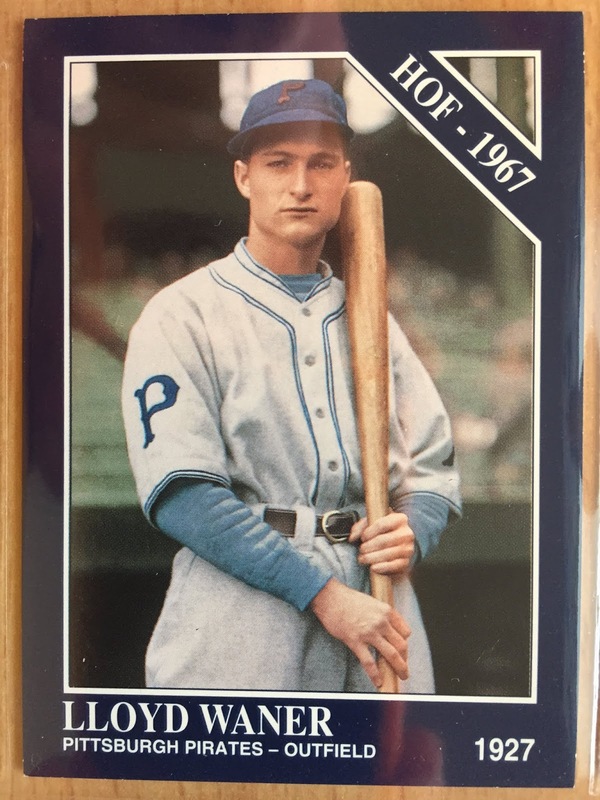 Lloyd Waner, a career 0.316 hitter, spent seventeen of his eighteen year career roaming the outfield for the Pirates. 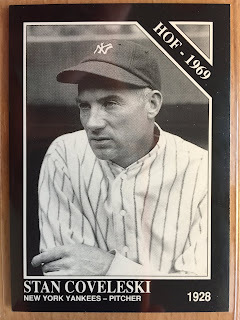 Lloyd, known as "Little Poison", spent the majority of his career playing alongside his older brother Paul "Big Poison" Waner, who I wrote about on Page 8. Lloyd was actually an inch taller and a couple of pounds heavier than Paul. Go figure. 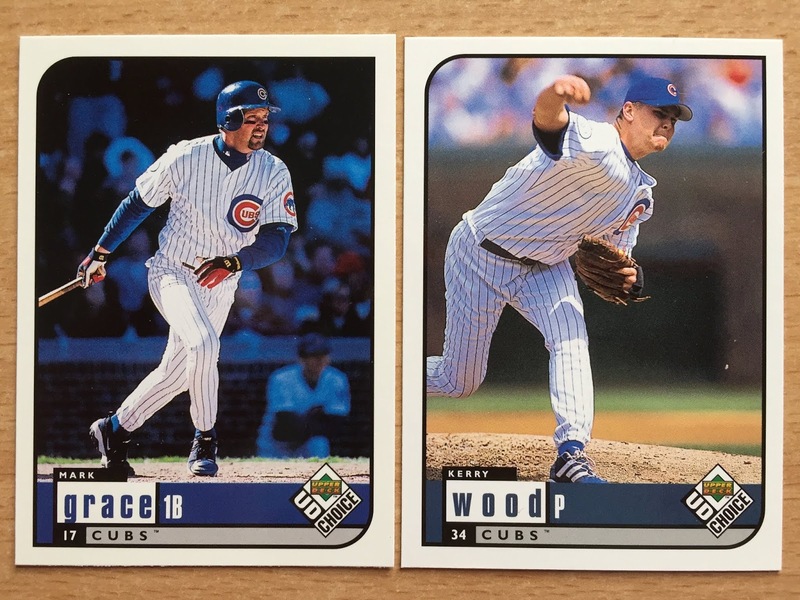 Baseball nicknames are sometimes a little goofy. 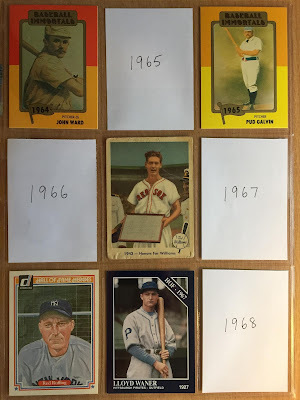 My favorite card from this grouping is the 1959 Fleer Ted Williams. 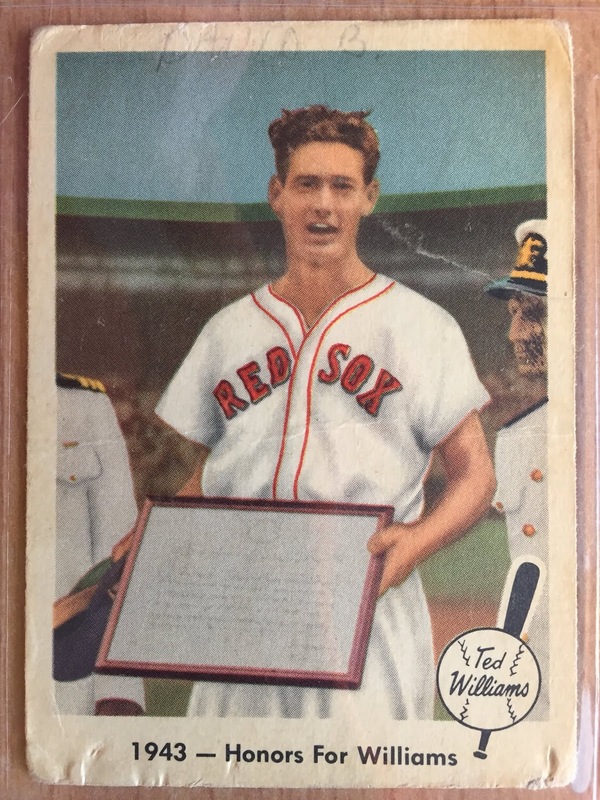 A card show dealer had a bunch of different Williams cards in a box for cheap and I was able to pick out the one I thought would best fit my binder project. It's a bit banged up, but that just adds more character! Also deserving of a mention is the colorized Conlon of Little Poison, which almost takes you back 90 years. Doesn't it? Good stuff. Thanks for reading along this week. Next time we'll take a look at Kiki, Goose and "The Man." If you can place two of three of those players then you get a gold star for the day! Sometimes I get the itch to buy retail, but during the last two years the voice of reason has invariably talked me out of adding a pack or blaster to the random grocery run. 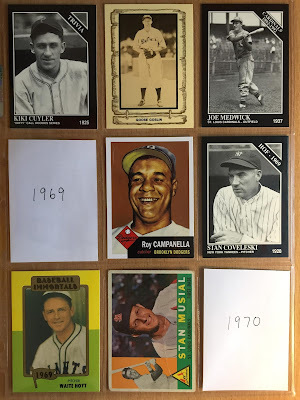 My collecting habits have changed during this time frame and I'm no longer interested in accumulating cards of players and teams I don't collect. Recently I scratched that itch, but went a alternative route to retail packs, and I invested in a 4-box break of 2016 Panini Pantheon. Individual boxes run just south of $200 and there are eight cards (all hits) in a box and eight boxes in a case of this high end product. Before buying into the break I did my homework and took a gander at the checklist. 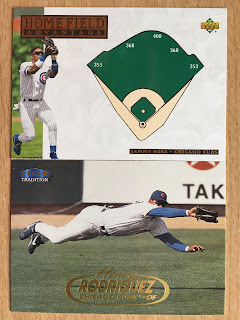 I found there were Cubs sprinkled throughout the product and they were all of bigger named players like Hack Wilson, Ernie Banks, Fergie Jenkins, Billy Williams, Andre Dawson, Ryne Sandberg, Greg Maddux and Mark Grace. 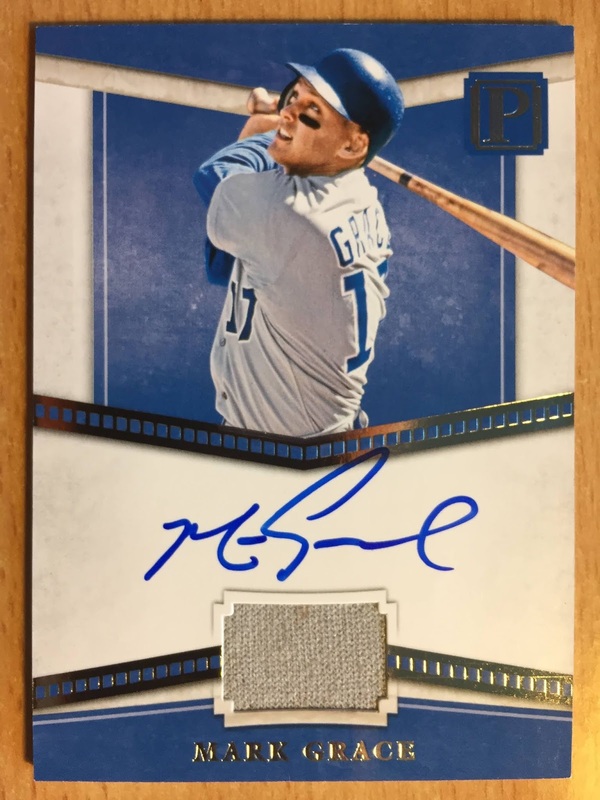 I found a trusted Ebay breaker and watched two of his breaks of the product. 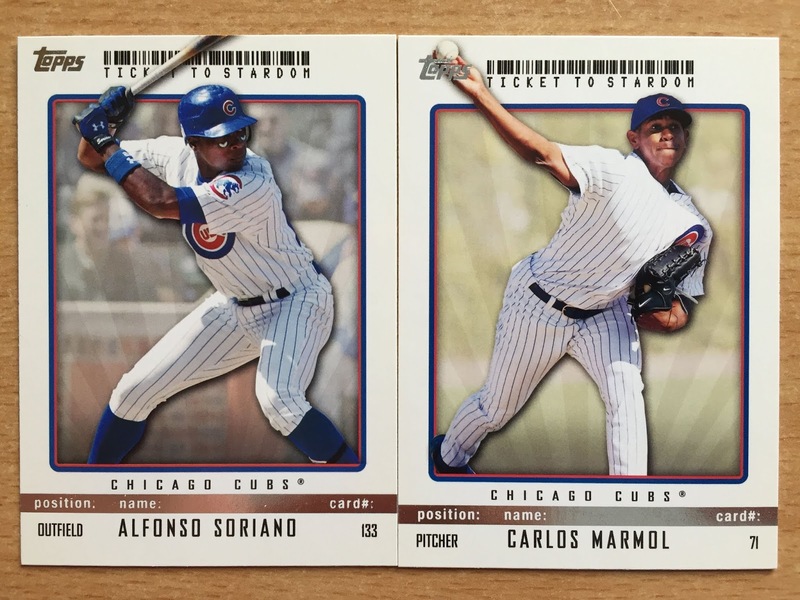 The first half case revealed one Cub card out of the 32 cards. Surprisingly, the Cubs were shut out in the second half of the case. Wow, that would have been a bummer if I bought in on that particular break. 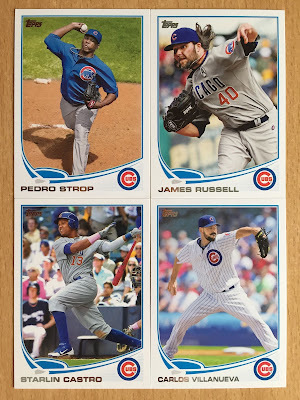 Doing the math, there was only one Cub card out of 64 in an entire case. Again, the Cubs are well represented within this product and I decided hitting on only 1 Cub out of 64 cards was more of the exception, rather than the rule. For the price of 1.5 blasters I bought into a 4 box break hoping my half case (32 cards) had the missing Cubs cards from the previous case. The break went live the same night the auction ended, but I'm no night owl so I watched the video on youtube the next morning. Overall, I think I did pretty well. For starters, I occasionally enjoy the thrill of trying to beat the odds. And something as simple as a well-done break, via video, can be very entertaining when you're invested. 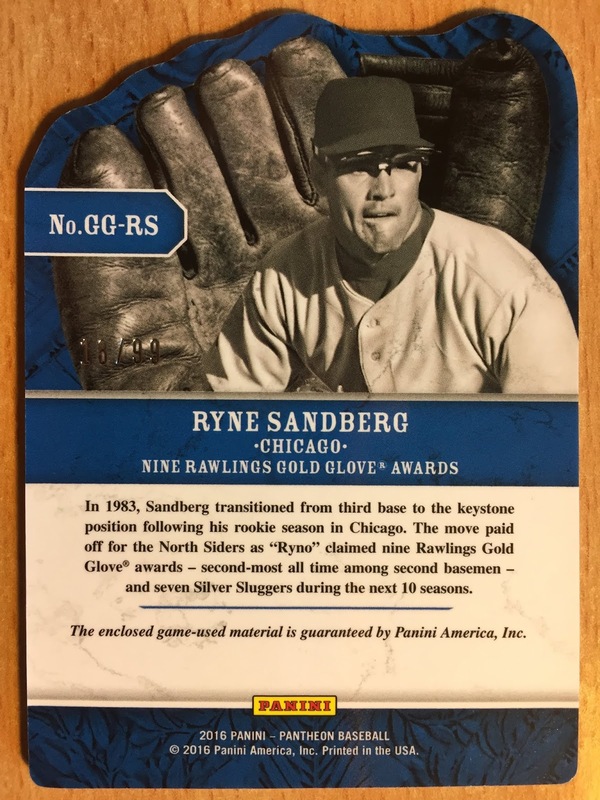 The Ryno card was revealed pretty early in the first box, which took the worry about being skunked away. 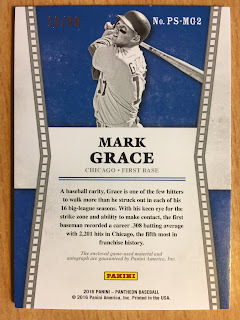 The Grace was at the tail end of the last box and was the icing on the cake! The cards are really well done. The card stock is super thick, the designs are nice, and I'm a sucker for an on-card autograph. Win-win. 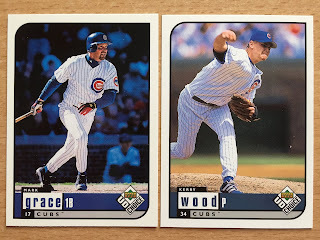 The Ryne Sandberg card goes right into my player collection (929 cards and counting) and the Grace auto-jersey is a fine addition to my Cubs "hits" box. I was hoping to really luck out and get something in the Hack Wilson or Ernie Banks department, but I'm not disappointed with my haul whatsoever. I don't participate in many breaks, but when I can find a discounted one with fair chance of winning something that fits in my collection I'll strike. For my money, it beats buying a blaster's worth of cards that I won't know what to do with or fist fulls of losing PowerBall tickets!